Coupons on WarriorPlus work like "Discounts" on your products/offers that can be assigned to specific buyers and/or affiliates as well as to specific tracking links. They can also be limited to a specific number of uses or have an expiration date. Coupons on WarriorPlus do NOT require the buyer to enter any codes. To create a coupon, click on "Vendors" in the top menu and then click on "coupons." Then click on the GREEN BUTTON that says "+ New Coupon"
1. You can choose to create your coupon based on the Dollar Value of the coupon (if the coupon value is $10, your buyers would receive $10 OFF the purchase price). 2. You can create a Discount Percentage which would represent the percentage of your buyers' savings. 3. You can enter the NEW Purchase Price, which is the new price INCLUDING your applied discount/coupon. Once you edit those details, you will be able to limit your coupon(s) to SPECIFIC OFFERS AND/OR PRODUCTS - OR you can have it be "global" and applied to ALL of your offers/products (by leaving it on "== ANY OFFER ==" etc). Typically, vendors will want coupons for SPECIFIC products and offers. 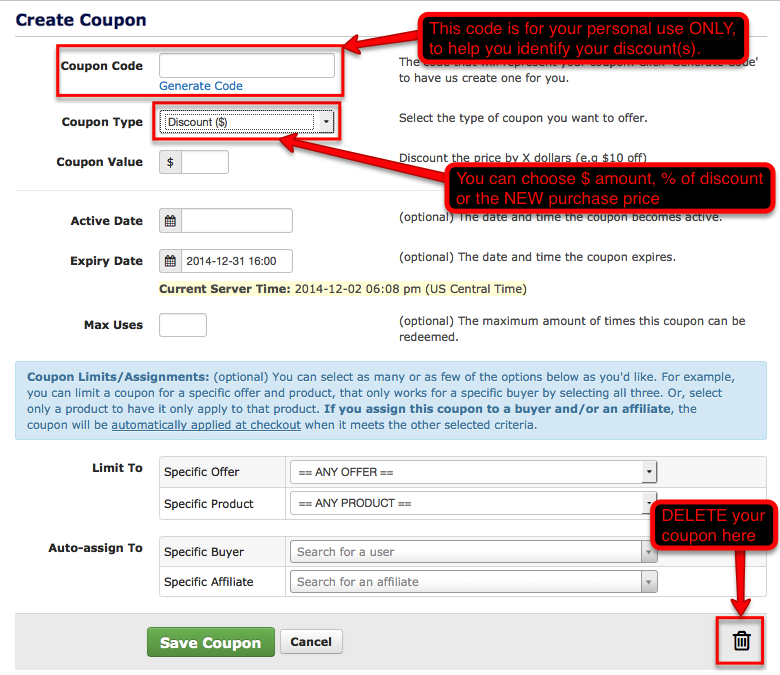 You can also auto-assign the coupon/discount to a specific BUYER and/or AFFILIATE. Once your coupon is complete, CLICK on "Save Coupon" and then you can assign it to specific tracking links if you desire. When you set up a tracking link and assign a coupon to it, every time you send traffic to that link (with the SubID) and the buy button is clicked, the coupon/discount will be applied (unless the coupon has otherwise expired or had its max uses met).